NASA-NOAA's Suomi NPP Satellite provided a night-time and infrared look at the Atlantic's latest hurricane that revealed the power under the clouds. NASA's GPM also provided a look at the rainfall being generated by Hurricane Irma. After forming in the eastern Atlantic Ocean on Wednesday tropical storm Irma strengthened and became a powerful category three hurricane on Thursday August 31, 2017. On Sept. 1 at 0347 UTC (Aug. 31 at 11:47 p.m. EDT) the Visible Infrared Imaging Radiometer Suite (VIIRS) instrument aboard NASA-NOAA's Suomi NPP satellite captured a night-time image of Harvey that showed the center of circulation had moved back into the Gulf of Mexico. 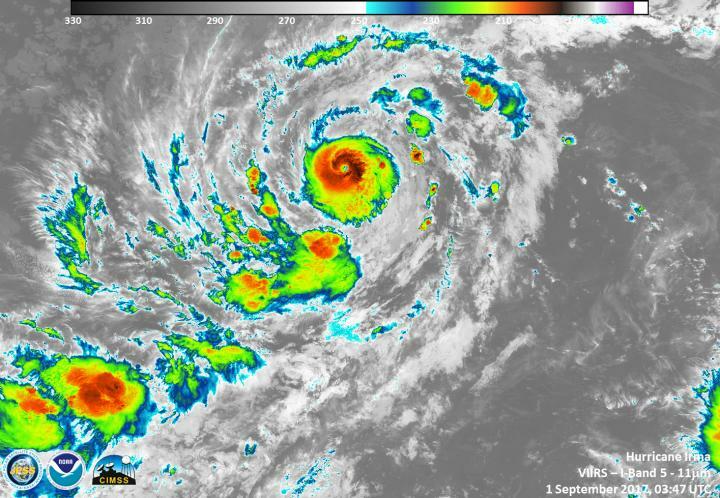 Infrared data from the VIIRS instrument aboard showed powerful thunderstorms around the eye were cloud top temperatures were as cold as 190 kelvin. The colder the cloud tops, the higher they are in the troposphere, and the more powerful the storms. NASA research has shown that storms with cloud top temperatures that cold have the potential to generate heavy rainfall. That heavy rainfall was confirmed by the Global Precipitation Measurement mission or GPM core satellite. Hurricane Irma was moving west-northwestward with winds of about 115 mph (100 knots) when the GPM core Observatory satellite saw it on September 1 at 1:47 a.m. EDT (0547 UTC). Data collected by GPM's Microwave Imager (GMI) and Dual-Frequency Precipitation Radar (DPR) instruments showed the locations and intensity of heavy precipitation within the hurricane. GPM's Radar (DPR Ku band) found that a powerful convective storm in a band of rain on Irma's northern side was dropping rain at a rate of almost 6.3 inches (159 mm) per hour. GPM's radar (DPR Ku Band) showed the height and the 3-D rainfall structure of powerful storms spiraling around hurricane Irma. DPR showed that storm tops were reaching heights of over 9.6 miles (15.5 km) in the band of powerful convective storms north of the hurricane's center. GPM is a joint mission between NASA and the Japanese space agency JAXA. The National Hurricane Center (NHC) said that at 11 a.m. EDT (1500 UTC) on Sept. 1 that Irma was undergoing an eyewall replacement cycle. The small eye was becoming less distinct, with both microwave and visible imagery indicating the presence of a forming outer eyewall. The center of Hurricane Irma was located near 18.5 degrees north latitude and 27.8 degrees west longitude. That's about 1,580 miles (2,540 km) east of the Leeward Islands. Irma was moving toward the west-northwest near 13 mph (20 kph). A turn toward the west is expected by tonight, followed by a turn toward the west-southwest on Saturday, Sept. 2. Maximum sustained winds are near 110 mph (175 kph) with higher gusts. Fluctuations in strength, up or down, are possible during the next few days, but Irma is expected to remain a powerful hurricane through the weekend. Hurricane-force winds extend outward up to 15 miles (30 km) from the center and tropical-storm-force winds extend outward up to 90 miles (150 km). The estimated minimum central pressure is 972 millibars. The NHC predicts that hurricane Irma will slowly intensify while heading toward the west-northwest. Irma is predicted to have winds of over 123 mph (110 knots) within the next five days. This would make Irma a strong category 3 hurricane on the Saffir-Simpson hurricane wind scale. There is some uncertainty about the long term direction of Irma's movement.